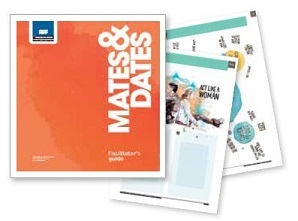 Mates & Dates is a healthy relationships programme for secondary school students. It’s designed to help prevent sexual and dating violence by teaching young people relationship skills and behaviours to carry with them throughout their lives. It’s about all kinds of relationships, including friends and family. Mates & Dates is a multi-year programme that is taught to years 9-13 in one 50-minute session each week for five weeks. It supports the four underlying and interdependent concepts at the heart of the Health and Physical Education Learning area, targeted at levels 4-8 of The New Zealand Curriculum.